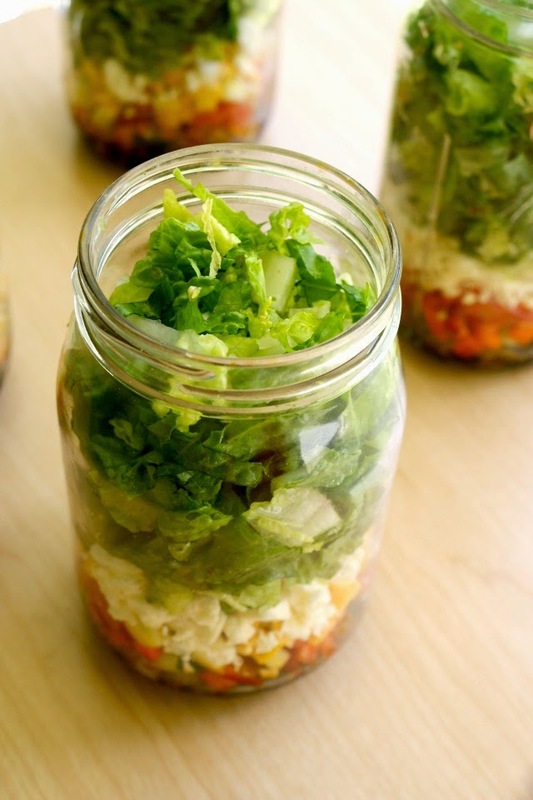 Make Ahead Mason Jar Salads are a convenient way to prep salads ahead of time in glass mason jars, dressing and all, where the lettuce and vegetables stay fresh and crisp...even after days in the fridge! I could eat a salad for lunch every day of my life. I'll usually eat them at least 4 days a week. The only drawback about eating a salad at home every day is the prep. Washing, chopping, assembling...it takes a lot more time than PB&J, for sure. Even if I prep the veggies ahead of time, taking out a bunch of tupperware containers of veggies and assembling it all is kind of a pain. 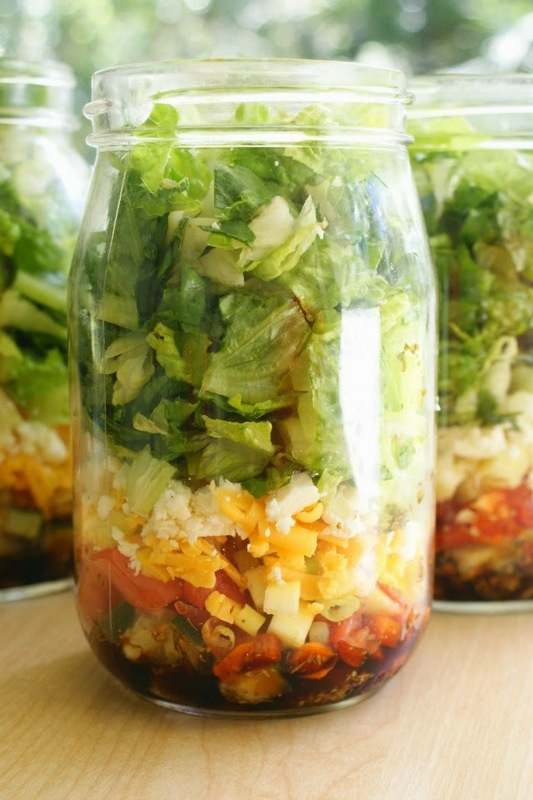 With these mason jar salads I can have my fave lunch every day without all of the work! Well, there's the work of assembling them all in the first place, but then I can just grab one from the fridge and dump it all out of the jar and the salad is done in seconds. It totally helps me to make good healthy choices at lunchtime, because I have (on more than one occasion) just grabbed a bag of chips instead of making a salad because it just felt like too much work. Lazy? A little. At least I'm honest. So, this post is really more like a how-to make a mason jar salad post rather than a recipe post. 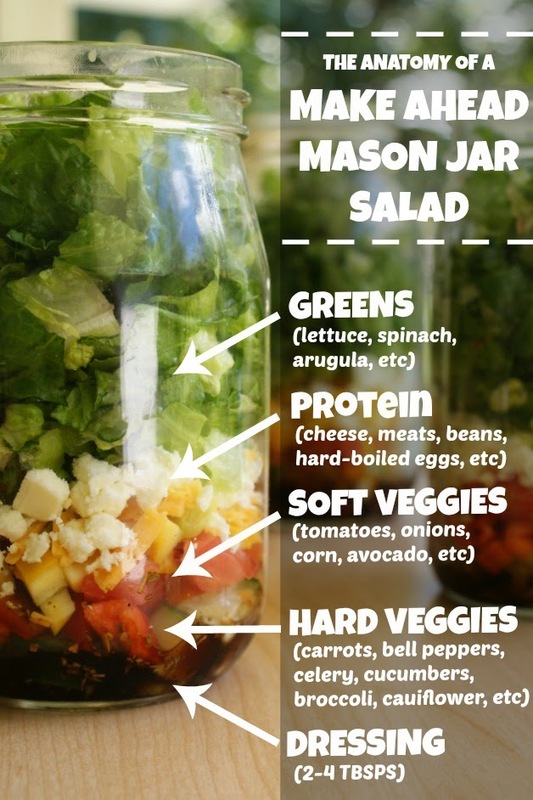 Because there is definitely a science behind the anatomy of a mason jar salad, but of course you can customize it based on what salad toppings and dressing you prefer. It's all about the layering. If you layer in the right order, nothing will get soggy and gross even after several days in the fridge. That's the beauty of these babies. So that's the method I use! Pretty awesome, right? If you're a daily salad eater like me, then you absolutely HAVE to try these! I usually make four at a time and then have a little something different (like leftovers) the other three days a week. They'll hold up for right around 5 days, they're perfect for lunch at work or at home. I'm not kidding when I say they are my new FAVORITE! Add the hard vegetables that will hold up to sitting in the dressing for a few days. By the last day, they'll be a little marinated, so to speak, but totally yummy. Think carrots, celery, bell peppers, cauliflower, broccoli, etc. Cut them as hunky as you can stand them. The bigger the chunks, the better they'll hold up to sitting in the dressing. Add the softer vegetables like tomatoes, corn, onions, avocado, etc. Add your choice of protein to the salad. This could be things like shredded cheese, cubed cooked meats, hard-boiled eggs or beans. Top everything off with the greens of your choice. My fave is romaine, but choose what you like. Cover and store in the fridge for up to five days. When ready to eat, turn the mason jar upside down and shake the contents into a bowl. The shaking to get the salad out of the jar usually spreads the dressing perfectly over the whole salad! I've seen others layer in different ways, but the most important thing to remember is to keep your jar upright until ready to eat. If the dressing gets all over the top layers, it'll be a soggy mess after even a day. Fun Fact: The jars pictured in the photos are jars my grandmother gave me. One of them (my favorite one to use for these salads) is an old glass mayo jar! What size mason jar are you using? Quart, pint? Quart. I've also found wide mouth jars work best. Where would you suggest placing nuts or seeds? I would put the nuts or seeds in between the greens and protein. I just discovered this last week and have been giving it a try from Monday. We love it here! Thanks for sharing! If that doesn't work go to http://tinyurl.com/PamperedChefCheryl and search for Make And Take Salad Pack. I love mine!